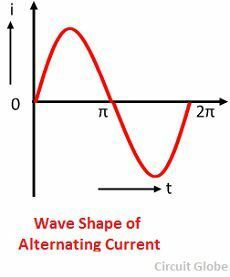 Definition: The current that changes its magnitude and polarity at regular intervals of time is called an alternating current.The major advantage of using the alternating current instead of direct current is that the alternating current is easily transformed from higher voltage level to lower voltage level. When the resistive load R is connected across the alternating source shown in the figure below, the current flows through it. The alternating current flows in one direction and then in the opposite direction when the polarity is reversed. The wave shape of the source voltage and the current flow through the circuit (i.e., load resistor) is shown in the figure below. The graph which represents the manner in which an alternating current changes with respect to time is known as wave shape or waveform. Usually, the alternating value is taken along the y-axis and the time taken to the x- axis. 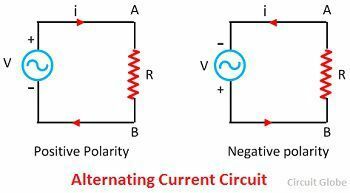 The alternating current varies in a different manner as shown in the figure below. Accordingly, their wave shapes are named in different ways, such as irregular wave, a triangular wave, square wave, periodic wave, sawtooth wave, the sine wave. An alternating current which varies according to the sine of angle θ is known as sinusoidal alternating current. The alternating current is generated in the power station because of the following reasons. The alternating current produces low iron and copper losses in AC rotating machine and transformer because it improves the efficiency of AC machines. The alternating current offer less interference to the nearby communication system (telephone lines etc.). The alternating supply is always used for domestic and industrial applications.